The Young Guns Cricket Club has been confirmed as the fourth team that will compete in the semi-finals of the Keith Arthurton Windsor Nagico T20 Tournament at Conaree Playing Field and also have an opportunity to move up into second place with one game still to play. Young Guns, after winning the toss, invited Sandy Point to have first knock in the game that was shortened to 15 overs per side. The Sandy Point innings got off to a shaky start after they lost their first wicket early. However a steady partnership between Greg Stanley and Wingrove “Parrot” George stabilized the innings for Sandy Point. When Mr. George departed for 13, Mr. Stanley followed shortly playing a lazy shot to mid-on for 22. Kenny Douglas however gave the Sandy Point’s innings some respectability with a boundary filled 38 to carry the defending champions up to 98-5 off their 15 overs. 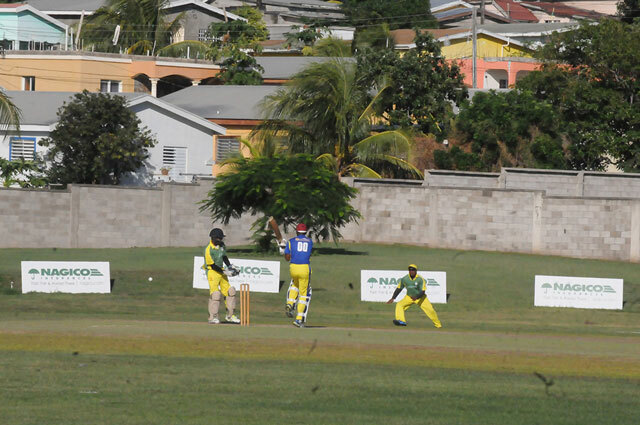 Sherman White, Andrew Simmonds and Bernard Island all had one wicket each for Young Guns. Needing 99 for victory Welton Edwards starred for Young Guns as he seemed in the mood to hit every delivery to the boundary and aimed to finish the game as fast as possible. Edwards kept swinging his bat as he passed his half-century. Edwards finished unbeaten on 82 as Young Guns cruised to a 10 wicket victory. His opening partnerJatin Patel finished on 17 not out. Earlier on Sunday the Empire Cricket Club recorded a nine wicket victory over Molineaux/Cayon Cricket Club who now exits the tournament. Molineaux Cayon won the toss and batted first and stuttered with the loss of early wickets. However Xavier Saunders and Larry Audain consolidated for the early losses with a half century stand. Mr. Saunders, struggling to cope with the conditions, had to retire hurt which sparked a middle order collapse that included Mr. Audain for 23. When Saunders came back later in the innings he lost his momentum and eventually perished for 35. Molineaux/Cayon only managed 102-4 from their 20 overs. For Empire Justin Athanaze was the pick of the bowlers with two wickets for 10 runs from his from his four over Wasim ‘Boom Boom’ Mentos also starred with the ball picking up two wickets for 17runs. In response Empire fans were left worried when they lost Mr. Mentos in the first over to a brilliant catch by wicketkeeper Saunders after for six. However Kejel Tyson and Theron Bassue safely guided the Empire team home without any major headache with Mr.Tyson finishing on 51and Bassue 31 to complete an eight wicket victory. Young Guns’ victory confirms them, League Leaders Newtown, Government Road All Stars and Empire will play in the Semi-finals. However the final league game between Young Guns and Haynes Smith will determine the final seeding.